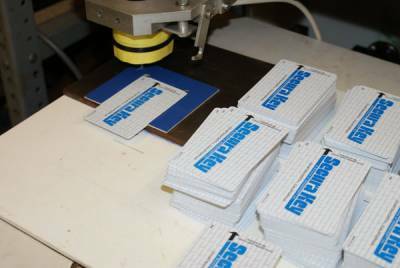 This is perhaps an unusual application for Mach3 and a CNC machine but more of these ‘legacy’ access cards were needed in a hurry. They have a Barium Ferrite core and are programmed with ‘magnetic domains’ some ‘north up’ some ‘south up’ in a defined pattern and are used to open magnetic locks. By fitting an electromagnet (in place of the spindle motor) which is half wave rectified and switched on / off by my forward / reverse spindle relays, all that was necessary was a small GCode program to create all the necessary domains with the correct orientation and position. Next time though, I think I will get them programmed in the USA by the card manufacturer.